One of my biggest pet peeves as a stadium assistant was when we would have an issue with an on-field event that had also occurred the season before I had arrived — like, “WHAT?! You’re telling me the firework show last year damaged the left field turf? Why did that happen? Did we ask the pyrotechnics to move their location? Did anyone tell the front office?” Having the capability to document all events – good, bad and ugly – is critical. 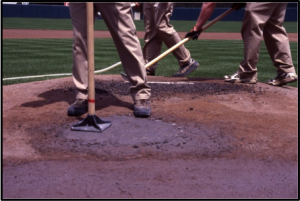 In an earlier post, “The Real Cost of Sports Field Maintenance Products“, Paul Zwaska shared how using the most expensive professional-grade clay on their Little League fields actually kept the pitcher’s mound and batter’s box in much better shape, and with less costs. The better grade clay reduced the damage to the clay areas by 70%. By the end of the season, they found they had used 50% less clay. By having documented what the fields used year-to-year, the grounds crew was able to discover that using the most expensive product actually a sound financial decision – AND the high-grade clay provided a better playing surface for the players.